I'd Have Baked A Tape! The aging of magnetic tape concerns everyone. Even as you read this, a DAT tape is waiting to clog the heads of your most difficult-to-clean-machine. Unlike my usual visits to the digital domain, this is a detour into the magnetic past! Are you ready to explore the time-space continuum? TIME TRAVELING -- PLEASE WAIT! People who make analog recording part of their daily routine take for granted that the tape is new and the machine is operable. When called upon to remaster or remix a vintage analog recording, it goes without saying that the machine must be in top form AND that your business should be insured. That said, there is one variable for which you have no control: tape condition. This is especially true for mid-seventies era high-output tapes such as AMPEX 406/407 and 456, 3M 250, and AGFA 468. It does not exclude those made well into the eighties. Don't attempt to play a "vintage" tape before reading this article! In order to expect full recovery, tapes that have been shelved for an extended period deserve special treatment just like a scuba diver must slowly return to the surface. Figure One shows how easy it is to identify Acetate simply by holding it up to light. Acetate is translucent, left, and Polyester is opaque, center. Tapes that have been poorly stored, right, will require extra care. The symptoms of "binder breakdown" are immediately obvious even when rewinding. Tearing sounds and sluggish behavior are clues to quit before the oxide comes off. Machines with stationary lifters (Ampex 440/1200, MCI and 3M) will, in many cases, stall well before reaching the halfway point. An older Studer, with its rotating guides, may not reveal any warning signs until the tape is played. Playing a bad tape is not recommended. Just trying to get through a three-minute pop song will require several cleanings. Once the precious sonic material collects on transport parts it is worthless, not to mention difficult to remove. Do you really want to risk damage to the master for the sake of getting a transfer? There is hope, so be patient. Several years ago it was discovered that baking tape at low temperature reactivated the binder making tapes playable as new. While convection ovens and hair dryers have been called into service, the most elegant and affordable solution came from my brother-in-law Gary, a metallurgist in St. Paul, Minnesota. 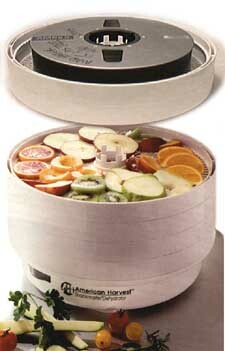 The device de jour is the Snackmaster Pro model FD-50 made by American Harvest (800-288-4545). At $85, with shipping, it comes standard with four trays, each of which can comfortably handle a reel of half-inch tape. (Additional trays and jerky mixes can be ordered. Allow four weeks for delivery.) To accommodate one- and two-inch tapes, modify one tray by cutting out the plastic spokes along the perimeter with a wire cutter. This creates a "dummy tray" adding height to the tray below. Figure Two shows the dehydrator as intended, with standard and modified trays overhead. Do not process food and tapes together! The FD-50 features an adjustable thermostat and a built-in fan to circulate the air. I checked for dangerous magnetic fields and found none, though I do use the upper trays just to be safe (the fan is in the bottom of the unit). The heat is adjustable from 95 to 145 degrees F., and is accurate within five degrees when checked with a photographic thermometer. Storing tapes "tail-out" after having been played minimizes the effects of "print-through" and improves the chances of long-term survival. "Print-through" is a form of mechanically induced tape echo. The winning combination of high record levels and fast winding will transfer signals from one layer of tape to another. Tail-out storage will hide print-through as "post echo." If you discover that the tape is unplayable while in fast wind, come to a slow stop. Fast winding the tape may cause further damage because oxide may adhere to the back of the previous layer. In addition, old splices may come apart. For the safest journey to the head, play the tape backwards first, then forward to create an even pack. The best machines for winding traumatized tapes are those with ALL rotating guides. The AMPEX ATR-100 and most Studer machines are well suited to the task. In addition, you will want to remove the head assembly otherwise a gooey oxide/binder cocktail will quickly collect on all stationary surfaces (heads, lifters and guides). Model 800 series Studer machines are dangerously powerful so don't use the remote, pay close attention and be ready to stop at a moment's notice. Nearly as good is using a 3-M isoloop machine, but thread the tape around the large capstan (it will fit into the small gap beside the capstan edge nearest you) and avoid all lifters, tape heads, and the reversing idler. That way only the backing will contact any fixed guides (be careful with shedding backing, especially prior to baking, which WILL help the backing, too, but not as much as the oxide side.) The oxide itself will only touch the surface of the capstan, nothing else. If the backing is not too bad you can create a very smooth wind (flip reels to wind a smooth head-out reel.) Don't attempt FF or REW, as the capstan won't move easily, and you might stretch the tape. If uncertain of the tape's condition but the pack is good, bake it anyway. When baked, the tape will expand and become loose around the hub. For this reason, use flanges to protect the tape from coming apart. Cooking temperature is between 130 and 140 degrees F. Tapes wound on plastic reels with small hubs should be rewound onto large reels with NAB hubs. Be careful to thread the tape around the hub without any "folds." The goal is to minimize "mechanical distortions" that can be impressed upon subsequent layers causing dropouts. Cooking times vary with tape width -- for Ampex tape from the '70, for example: three to four hours (minimum) for quarter-inch tapes, five hours for half-inch, six hours for one-inch and eight hours for two-inch tapes. 3-M tapes from the '80's will require only around half that time. Temperature, tape condition and number of reels will also affect the baking period. You may want to flip wide tapes once every hour. Afterwards, return the tape to its box, allowing it cool for the same amount of time it was baked. To confirm the process, I sandwich a piece of cloth around the tape while rewinding. Figure Three shows what happens when the tape is not baked. A minimal amount of oxide shed is normal. Excess shed will cause friction to build up within the cloth. If so, re-bake. Worn heads will aggravate the process of getting a good transfer. Figure Four, left, features three closeup views of a typical two-track head. Lighting anomalies conveniently darkened the wear pattern of the "worn head," which appears as a slightly curved horizontal bar in the center of the bottom image. 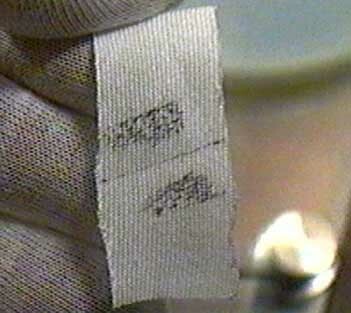 From the side-views above, arrows point to where oxide gets trapped in the grooves worn by the tape. Use a toothpick or business card to remove stubborn dirt from here. Worn heads like this one to the left should be re-lapped to improve high-frequency response and reduce low-frequency muddiness (head hump, as it's called.) To prevent a future groove from trapping dirt and degrading performance, relief slots can be cut into the surface, as indicated by arrows in the top view. Contact John French, at JRF Magnetic Sciences (973-579-5773) for further details on magnetic tape head restoration and storage, and other related services and products. Eddie has a library of tapes to restore from his days as Italian heavy-mental crooner, "Fred Zeppole." He is currently restoring tapes from 1976 to 1980. Note from Wendy: Thanks to Eddie Ciletti, for permission to reuse this article, somewhat edited and expanded, on our site. This and other excellent studio information, clearly and wittily presented, can be found on Eddie's fascinating Tangible Technology website -- take a look!